JOHN MARSHALL was born on September 24, 1755, in Germantown, Virginia. Following service in the Revolutionary War, he attended a course of law lectures conducted by George Wythe at the College of William and Mary and continued the private study of law until his admission to practice in 1780. Marshall was elected to the Virginia House of Delegates in 1782, 1787, and 1795. In 1797, he accepted appointment as one of three envoys sent on a diplomatic mission to France. 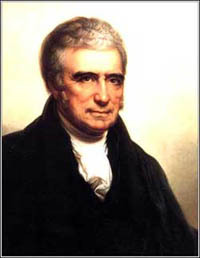 Although offered appointment to the United States Supreme Court in 1798, Marshall preferred to remain in private practice. 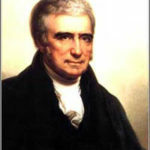 Marshall was elected to the United States House of Representatives in 1799, and in 1800 was appointed Secretary of State by President John Adams. The following year, President Adams nominated Marshall Chief Justice of the United States, and the Senate confirmed the appointment on January 27, 1801. Notwithstanding his appointment as Chief Justice, Marshall continued to serve as Secretary of State throughout President Adams’ term and, at President Thomas Jefferson’s request, he remained in that office briefly following Jefferson’s inauguration. 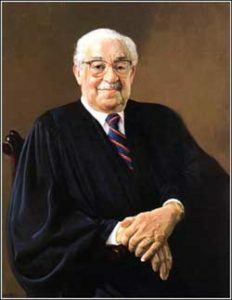 Marshall served as Chief Justice for 34 years, the longest tenure of any Chief Justice. During his tenure, he helped establish the Supreme Court as the final authority on the meaning of the Constitution. Marshall died on July 6, 1835, at the age of seventy-nine. 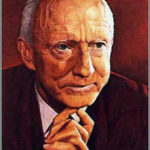 HUGO L. BLACK was born in Harlan, Alabama, on February 27, 1886. 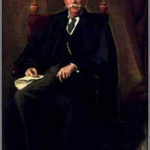 He entered Birmingham Medical College in 1903, but after one year transferred to the University of Alabama Law School. He received his law degree in 1906. He was admitted to the bar and established a law practice in Ashland Alabama. The following year, a fire destroyed his office and library, and Black moved to Birmingham. In 1911, he became a part-time police court judge, and in 1914 he was elected Public Prosecutor for Jefferson County. After military service in World War I, Black returned to his Birmingham law practice. In 1927, he was elected to the United States Senate and was re-elected six years later. In 1933, Black introduced legislation providing for a 30-hour work week which, as amended, became the Fair Labor Standards Act of 1938. President Franklin D. Roosevelt nominated Black to the Supreme Court of the United States on August 12, 1937, and the Senate confirmed the appointment five days later. 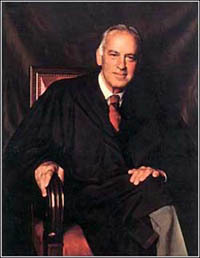 Black retired from the Supreme Court on September 17, 1971, after thirty-four years of service. He died on September 25, 1971, at the age of eighty-five. POTTER STEWART was born in Jackson, Michigan, on January 23, 1915. He was graduated from Yale College in 1937. After one year of postgraduate study at Cambridge University, England, he enrolled in Yale Law School. Following graduation in 1941, Stewart worked in a New York law firm. Stewart’s legal career had just begun when the United States entered World War II. He served as an officer in the United States Navy and occasionally performed legal services in court-martials. After the War he practiced law in New York but soon returned to Cincinnati and joined a law firm there. Stewart practiced law in Cincinnati until 1954. He was twice elected to the City Counsel and served as Vice Mayor form 1952 to 1953. 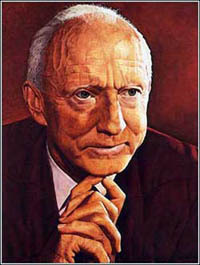 President Dwight D. Eisenhower appointed Stewart to the United States Court of Appeals for the Sixth Circuit in 1954, where he served for four years. On October 14, 1958, President Eisenhower gave Stewart a recess appointment to the Supreme Court of the United States. On January 17, 1959, Stewart was formally nominated to the Court, and the Senate confirmed the appointment on May 5, 1959. 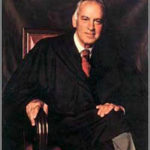 Stewart retired from the Supreme Court on July 3, 1981, after twenty-three years of service. He died on December 7, 1985, at the age of seventy. OLIVER WENDELL HOLMES, JR. was born on March 8, 1841, in Boston, Massachusetts. He was graduated from Harvard College in 1861. Holmes served for three years with the Massachusetts Twentieth Volunteers during the Civil War. He was wounded three times. In 1866 he returned to Harvard and received his law degree. The following year Holmes was admitted to the bar and joined a law firm in Boston, where he practiced for fifteen years. Holmes taught law at his alma mater, edited the American Law Review, and lectured at the Lowe Institute. In 1881, he published a series of twelve lectures on the common law, which was translated into several languages. In 1882, while working as a full professor at Harvard Law School, Holmes was appointed by the Governor to the Supreme Court of Massachusetts. He served on that Court for twenty years, the last three as Chief Justice. On December 2, 1902, President Theodore Roosevelt nominated Holmes to the Supreme Court of the United States. The Senate confirmed the appointment two days later. 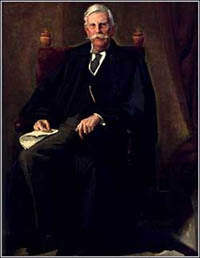 Holmes served on the Supreme Court for twenty-nine years and retired on January 12, 1932. He died on March 6, 1935, two days short of his ninety-fourth birthday. THURGOOD MARSHALL was born in Baltimore, Maryland, on July 2, 1908. He was graduated in 1930 from Lincoln University and in 1933 from Howard University Law School in Washington, D.C. Marshall began a legal career as counsel to the Baltimore Branch of the National Association for the Advancement of Colored People (NAACP). He joined the national legal staff in 1936 and in 1938 became Chief Legal Officer. In 1940, the NAACP created the Legal Defense and Education Fund, with Marshall as its Director and Counsel. For more than twenty years Marshall coordinated the NAACP effort to end racial segregation. In 1954, he argued the case of Brown v. Board of Education before the Supreme Court of the United States. President John F. Kennedy appointed Marshall to the United States Court of Appeals for the Second Circuit in 1961. Four years later, President Lyndon B. Johnson appointed him Solicitor General of the United States. President Johnson nominated Marshall to the Supreme Court of the United States on June 13, 1967. The Senate confirmed the appointment on August 30, 1967. 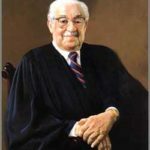 Marshall served twenty-three years on the Supreme Court, retiring on June 17, 1991, at the age of eighty-two. “The Establishment Clause prohibits government from making adherence to a religion relevant in any way to a person’s standing in the political community.” Lynch v. Donnelly, 465 U.S. 668, at 687 (1984), concurring opinion by Sandra Day O’Connor. 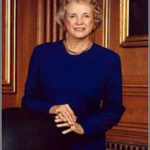 SANDRA DAY O’CONNOR was born in El Paso, Texas, on March 26, 1930. She was graduated from Stanford University in 1950 and Stanford University Law School in 1952. After graduation, O’Connor became a Deputy County Attorney of San Mateo, California. She moved to Germany and worked as a civilian attorney for the United States Army in Frankfurt from 1954 to 1957. Upon her return to the United States, O’Connor engaged in private law practice. She was appointed to the Arizona State Senate in 1969 to fill an unexpired term, and the following year she was elected to the State Senate. Twice re-elected, she was majority leader of the State Senate from 1973 to 1974. 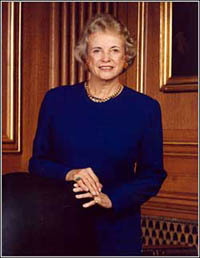 O’Connor was elected to the Maricopa County Superior Court in 1975 and appointed to the Arizona Court of Appeals in 1999. President Ronald Reagan nominated O’Connor to the Supreme Court of the United States on August 19, 1981. The Senate confirmed the appointment on September 21, 1981, making O’Connor the first female Associate Justice in the history of the Court.